Chief Deputy Clark was shot and killed by a burglar. At approximately 9 p.m., the 37-year-old victim and another deputy responded to a Uintah farm on a complaint of trespassing. The two officers arrested a vagrant and were returning to Ogden in a buggy when they observed a man entering a boxcar on a rail siding. When they stopped to investigate, the man opened fire on them with a .32-caliber automatic pistol. 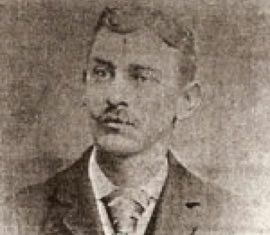 Deputy Clark was shot four times and died a few minutes later. The other deputy and the suspect were both wounded. The killer was never identified. Deputy Clark was married but had no children. He is buried in Ogden City Cemetery. His bronze name plaque is sponsored by the Weber County Deputy Sheriff’s Association. I am currenrtly working on getting his name added to the National Memorial in Washington DC. The Utah Peace Officer Association is going to be honoring Chief Deputy Seymore Clark at the Fallen Officer Trail Ride in Moab on April 18 2015. We would like to invite Family and friends to come to the event to help Honor Chief Deputy Clark and all our Fallen Officers.